This is Sacco’s cap. Actually, this is a hat. I am showing you a hat. Actually, I am showing you a projection of a color printout of a scan of a picture from a book of a hat. The authenticity was never the point. In Send for the Million Men, now at HERE Arts Center, creator Joseph Silovsky plays with claims of realness from the first moments of the productions: there is a baseball, a car, a miniature tree–all imposters with regards to physical makeup, but presented to us as part of a larger truth. As Silovsky tells the story of Sacco, Vanzetti, and the corrupt system that delivered them a failed trial, the realism (or lack-there-of) of his props falls out of focus. Although we’re guided through the evening by hosts both man and machine, the act of storytelling is the human current that runs through every scene. When Silovsky shows us a cut-out of a tree, meant to represent the one Vanzetti could see from his prison window, he is quick to add that the silhouette of the tree isn’t based on its real-life counterpoint. He then tells us that he based it on the “survivor tree” in the memorial garden in Oklahoma City. Before the audiences’ minds start to wander off, unable to make a connection, Silovsky calmly and plainly fills in the gaps: Vanzetti misquoting a line of St. Augustine, the text on Timothy McVeigh’s t-shirt at the moment he was arrested, the glass of water Silovsky’s mother went to retrieve in the Murrah Federal Building in 1995. This is the moment during Send for the Million Men in which we place our trust in symbols, and never look back. When I witnessed Send for the Million Men, I was primed for Silovsky’s object theater. In recent weeks, I had been thinking more and more about storytelling, and the line between when our theater becomes a lie or a game. We place a high value on immersion: as audiences members, we respect the dollars that it takes to make us forget that we’re in a theater, forget that there is traffic and rain outside, forget that the A train is inexplicably running on the F line. But we’re never truly forgetting and never truly immersed, even if the best of cases. If there isn’t the promise of immersion, or even the promise of authenticity, then there is no need for the promise of perfection. When Silovsky dropped a prop, flubbed a line, or when the cleverly stunning video projections by Victor Morales went a little haywire, it caused no harm to the story we were being told. 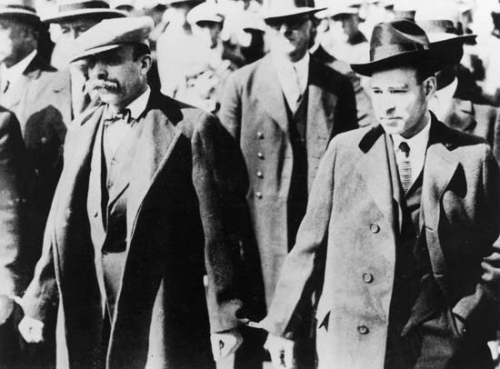 Which isn’t to say that it was a flawless event—occasionally it was hard to follow Silovsky’s presentation of Sacco and Vanzetti’s timeline, and the constant onslaught of character names proved hard to retain. However, the rare muddiness of the evening was easily forgotten in favor of the humanity of the story, and the fervor of the storytellers. I often like to play a game when I’m an audience member, and try to guess where the ticket dollars go–what exactly we’re getting, or asking for, in exchange for our ticket. More often than not, I see my dollars in the set design, or in a dozen Equity contracts, or in ASCAP fees. Sitting in the audience of Send for the Million Men, it felt like a rare honest transaction. In exchange for a ticket, Mr. Silovsky gave us his time. We gave him our attention and he gave us an electrified lecture. In the final moments of the show, when a paper funeral procession gives way to a slow lemming march of wooden men, Silovsky’s object theater delivers the emotional stomach punch that was missing from your high school Sacco and Vanzetti lecture. It was never about suspending disbelief; it was always about truth through artifice. A Boston native, Jenna Clark Embrey completed her undergraduate studies at Dickinson College, and received an MFA in Dramaturgy from the ART/MXAT Institute for Advanced Theater Training at Harvard. Currently the Director of Marketing at St. Ann’s Warehouse, her freelance writing has appeared on The Rumpus, McSweeney’s, Vol. 1 Brooklyn, and The New York Times Online. A Boston native, Jenna Clark Embrey completed her undergraduate studies at Dickinson College, and received an MFA in Dramaturgy from the ART/MXAT Institute for Advanced Theater Training at Harvard. Currently the Director of Marketing at St. Ann's Warehouse, her freelance writing has appeared on The Rumpus, McSweeney's, Vol. 1 Brooklyn, and The New York Times Online.